Chicago Days - Growing Up Absurd on the South Side, and the poetry of Ken Stange. Chicago Days - Growing Up Absurd on the South Side. Ken Stange. Two Cultures Press. North Bay, Ontario. 2016. 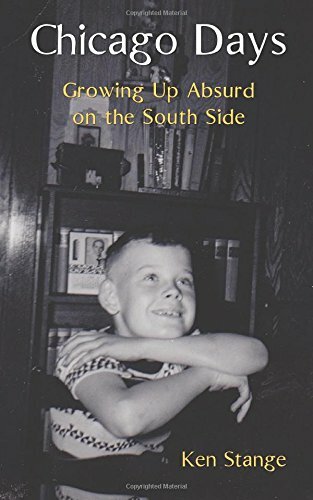 Several weeks ago Today's book of poetry received the late Ken Stange's autobiography Chicago Days - Growing Up Absurd on the South Side in the mail from Ken's widow Ursula. Published posthumously Chicago Days tells us everything we need to know about the early years of Stange's life. Today's book of poetry is proud to give Chicago Days some space and attention on our blog simply because Ken was our friend but it is poetry we are interested in and the very productive Ken Stange left us nineteen volumes of published work during his all too short visit to our planet. Today's book of poetry first met Ken Stange when I was installing a project titled Wired in the White Water Gallery for the late artist Chris MacGhee. Ken, if I remember correctly, was on the board of directors for White Water and was there to help smooth the waters. After the installation he showed us where the beer was at. Then the books started to arrive wherever it was I was living. I had Milo, our head tech, check out the stacks and he came back with nine books of Stange's poetry. They will have to do as a tasting menu. When going through this beautiful pile I found a letter from October, 1980 that Ken had sent me stuffed between the pages of Nocturnal Rhythms and it contained an unpublished poem. I'd like to share it with the Today's book of poetry audience. Ken Stange was an important friend for me and a great supporter. Over the years I invited Ken to read at every poetry series I had a hand in. Audiences loved him. Ken commanded a room with such a gently assured manner so full of confidence that you knew right away that he was "one of the good guys" as our Southern correspondent the Twangster might say. 1. Where is the smoke in your cigarette before it is lit? 2. Where does your wife go after she leaves you? 3. Where is the life in a fire that's been doused? 1. Where is the poem before it is written? 2. Where is the poet once the poem is written? 3. Where does the poem go after being erased? reason that I choose to call my major works hypotheses. completed 10 November 2015, is Hypothesis 20." Today's book of poetry was always quite willing to trundle off and down whatever road Ken Stange wanted to venture because it was always a learning process I enjoyed. The surreal connections Ken made between poetry/art and science were always invigorating but we were always most moved by his very human heart. may be a woman. It may be an illness. It may be a dangerous game. repeatedly disrupted my own happiness. in this struggle dulls them. Ken Stange was an American who chose to be Canadian, a teacher, a poet, a husband, a father and he was my friend. Not that many of us get to leave such a fine and compelling history of our time on this hurtling orb. Good-bye Sir Ken of Stange, See you anon. Ken Stange is the author of twenty books of poetry and fiction, hundreds of publications in literary and scientific journals, and the winner of the 2011 Exile/Vanderbilt prize for short fiction. 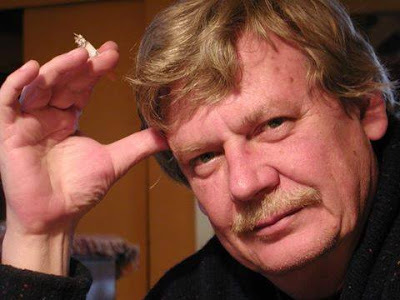 He is also a visual artist and Professor Emeritus at Nipissing University. His special interest is the relationship of art and science and creativity. He has learned to appreciate absurdity.